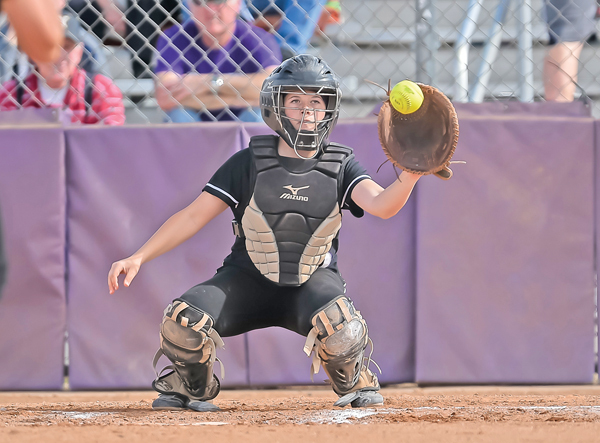 The Riverton High School softball team is on a roll. Not like butter and honey, but scoring runs and adding wins to the victory column. “We have had our ups and downs this year, but definitely the girls have grown and developed a lot this season. I see positive things going on that make me excited to finish the season strong,” head coach Katelyn Elliot said. Elliot, in her first year as head coach at Riverton, was an assistant last season under Brooke Olson. In 2012 she was Pac-12 All-Conference Honorable Mention with the University of Utah and an All-American in 2010 at Salt Lake Community College. She graduated from Spanish Fork High School where she helped the Dons to three straight state championships. Elliot hit three homeruns in one game for the Utes against Arizona State (May 2012). The Silverwolves hitters have copied her offensive prowess scoring runs in bunches this season. They have scored 192 runs in 17 games, while only allowing their opponents 81. Their team batting average is .455 and they have had 235 hits. In their first region game against Lehi the Sivlerwolves and Pioneers exchanged the lead five times before the Silverwolves walked away with the one run victory. Senior Kelsey Nokes doubled to score junior Katie Alder in the bottom of the eighth for the 5-4 victory; junior pitcher Jordan Lockhart recorded seven strikeouts in eight innings for the victory. “Kelsey is a fun kid. I think she is one of the most coachable kids I have ever had. She has come out this season determined and I can tell she has put in the extra commitment into her game. She has had a heck of a season,” Elliot said. Nokes is hitting .519 and has clubbed three homeruns; Lockhart has struck out 72 opposing hitters. “We have scored a lot of runs. I think the hitters in this state are really good. Our pitching is coming around and holding its own. Jordan has put in the extra time after practice to get better. I also think Sarah Linford has improved through a few kinks, but we are a very young team,” Elliot said. Underclassmen KC Whiting, Sheyenne Dyer and Madison Tuft have played significant time this season, combining for 28 RBIs. “If these young girls were not ready I would not put them in there,” Elliot said. The Silverwolves are 6-3 in Region games this season and are tied with Lehi for second place. They lost to Herriman 4-2 and 16-13. The state tournament is scheduled to begin Tuesday, May 12.